You are here: Home / Strategy / How to Stop Making Careless Mistakes on the GMAT? How to Stop Making Careless Mistakes on the GMAT? Read Carefully: Read the question very carefully and read it several times. On the difficult problems, you will not grasp the entire question on one reading. You may have to read it two or three times, or more. In general, harder questions require several readings. Stay organized: Do all of your scratch work in a systematic manner. I do it in a horizontal fashion and draw a line to separate different problems. In case of data sufficiency, I also lay out the statements in a horizontal fashion. 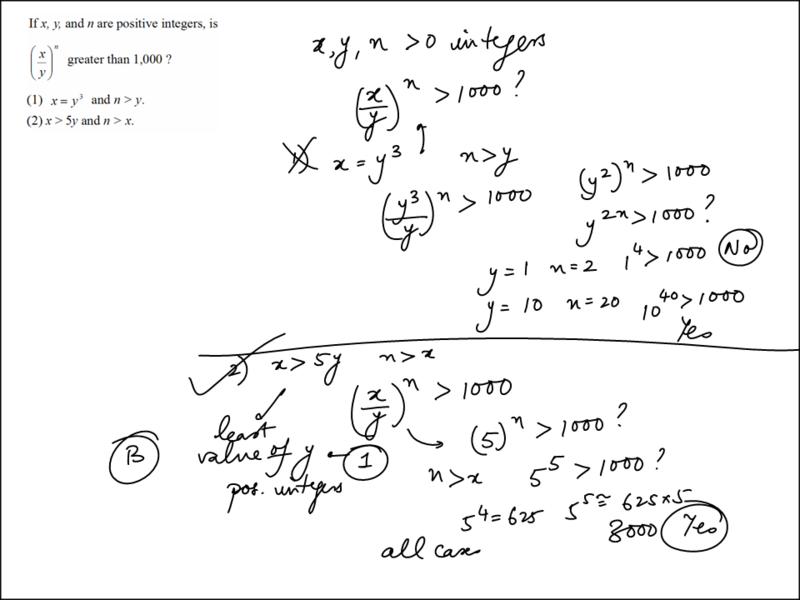 See the image below that shows my actual work for a GMAT problem. This is important for data sufficiency, because often you may reuse an example in statement 2 that you generated in statement 1. See the two images below where I have shown my actual scratch work on official GMAT questions that I have not seen before. The flow of my work may not be entirely clear to others but it is clear to me, which is what is key as a test taker. Write legibly: Your work should be clear enough that you can read your own handwriting. This is helpful in situations when you end up with an answer that is not in one of the answer choices. This often happens when one makes a careless mistake. To spot your mistake it helps if your work is written in a clear and legible manner. Reread the question at the end: Once you have completed the problem, reread the question to make sure you are answering what the question is asking for. For example, if you defined a variable x to solve the problem, check to make sure the question is not asking for the value of x-2. Example#1: Actual scratch work for a Data Sufficiency Problem. Example#2: Actual scratch work for a Data Sufficiency Problem. In the above data sufficiency questions, you will notice that I don’t do the ABCDE/12TEN strategy for data sufficiency. This is a matter of personal preference, I find striking out the letters breaks my flow as far as doing the problem is concerned, and also wastes time. Instead, I just mark it with a tick or a cross depending on whether the statement is sufficient or not, only then I select the final answer. I leave it up to you to choose the specific strategy that appeals to you.